Have you found an online vendor selling Panama-Pacific Panama-Pacific 9? I have been wanting to try this rum for quite some time, so I picked up a bottle today. The aroma is alcohol and oak with the same two flavors going down the pipe. Holy moly! Does it ever burn! Then I read the fine print on the label which states that it is 94.6 proof. This is definitely rum for whiskey lovers and it is quite dry. For me, it is best enjoyed on the rocks and this is when the other flavors finally come out. It is not very complex at all. It is just pure and simple rum. However, as a mixer it ruined a perfectly good Pepsi. Update December 1, 2018: While watching DVD's of fairly recent live Rolling Stones concerts in anticipation of their upcoming USA tour in the spring of 2019, I sipped this one on the rocks as I first recommended. After drinking Flor de Cana 7, this one pales in comparison. It is just too dull and boring and too much overproof. I have no choice except to lower my rating from a 7 to a 5 and will never buy this one again. In my overall rankings, I now have a much cheaper bar staple being rated about 7 points higher. 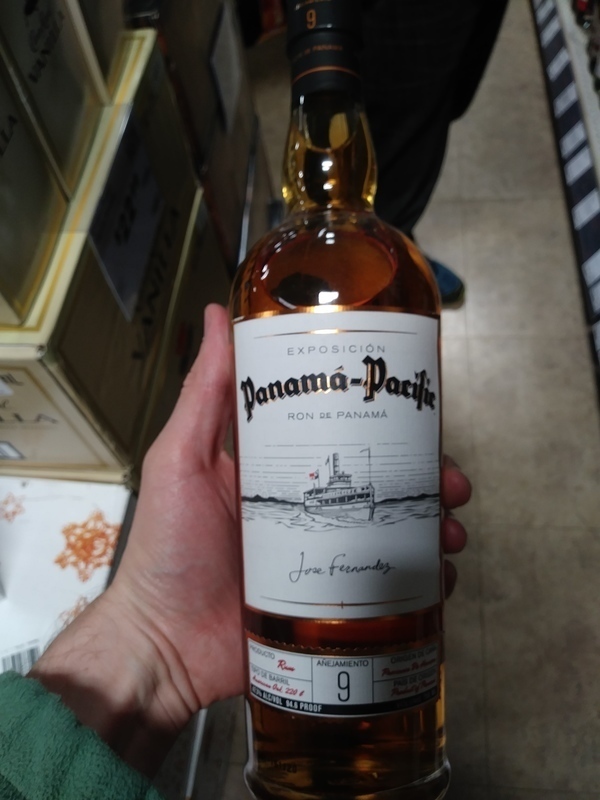 Between $7 per bottle of the bar staple versus $29 per bottle of this Panama Pacific, I will gladly choose the bar staple for both taste and price. This is really quite sad! Don't be fooled by rums from this distiller! By the way, the bar staple is not from Bacardi or Captain Morgan. Enjoyed a glass of Panama Pacific 9y with my friend while road tripping through 18 states and 5,000 miles. Nice and unique bottle and label design. Amber color. Plenty of oak and some vanilla to the nose and palate. Quite a strong burn at the end. Whisky lovers can easily add 2 points. I tried the 23 at a cigar lounge and enjoyed it quite a bit. When I purchased a bottle of the 9 and tried it at home, I found that it has a similar deep oaky flavor and I did not have the heart to rate it lower. 7.5 for both on my scale. If I tried them side by side, I might end up changing my rating(s). Stay tuned! I tried this at a rum festival, and was very impressed with the smoothness and balance of this offering. Indeed, it was among my favorites at the event. Highly recommended. Edit 8/2017 - Rich, slightly sweet, and pleasantly bottled at 47.3%ABV. Priced under $30, this is an ideal "Spanish style" mixing rum, that can also be enjoyed neat. Still highly recommended. Some anise, coffee, honey, oak... tobacco and leather. Slick and green tinged. I would speculate glycerol as it is quite slick. Very reminiscent of Dictador but less sweet/ High ABV saves it IMO. I was so impressed with the 23 year old that I went back to grab the 9 the very next day. I'm a firm believer in side by side tasting. It's not enough to just say the sky is blue, wiki has 67 shades of blue listed and without 2 points how can you measure? Beyond the obvious age difference it should be noted that the younger of the two is bottled 5% higher at 94.6 proof. I most certainly had to let them breath for a few minutes to clear the air so to speak. These are big rums and I did need to resort to a salted baguette crisp or two for a little palette cleansing while sampling. The nose is pretty non-discernible, conventional wisdom says the elder is softer and it is, but here's the thing, big brother is not much heavier with barrel notes. The Oak in the younger is there but it's wispy. I absolutely love and agree with the 9 being bottled at a higher ABV. It cuts the less refined and mellowed sugars of it's elder and in doing so becomes multifaceted. It's closer to the stalk and more vibrant. Hitting the 9 with a splash of H2O cutting the burn left me with the distinct mind set that the Panama-Pacific rums are 100% about the quality of the cane and the aging is solely for the intricate nuances. Which is the obvious function of aging most everything anyways. Ultimately everything ages and pairing these siblings side by side can easily turn the evening into a metaphysical exercise. At the very least I came away with a better grip on what the long idle time does too fermented distilled sugar as it basks in oak at equatorial climates. Finally in a clean dry glass tilt test as well as a swirl test our mature girl gives up the legs a little quicker. I think I'd like to live with the 23 but at $30 out the door the 9 is steamrolling.